Hugh Bryden’s work as a visual artist has long been recognised, but he is now becoming a much published poet, creating beautiful hand printed editions of his work. His poems, which are written in both Scots and English, are both poignant and humourous! 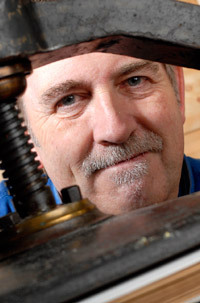 Hugh has performed, exhibited his work, and run workshops at the Bakehouse.